We offer a wide range of supplying Second Hand Chain Blocks, available in different sizes and as per customers’ specifications. It is a simple machine with wheel and groove, in which a rope/wife is run to change the direction of force applied to the rope/wire. It is used to lift heavy loads from the docks, warehouses, go downs etc. Keeping in the mind the different needs of our valued clients, we are actively committed towards offering premium quality Lifting Hoist. 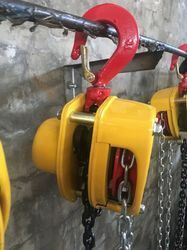 We offer a wide range of supplying second hand chain pulley block, available in different sizes and as per customers’ specifications. It is a simple machine with wheel and groove, in which a rope/wife is run to change the direction of force applied to the rope/wire. 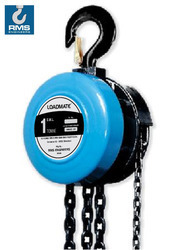 It is used to lift heavy loads from the docks, warehouses, go downs etc.